It is the Sabbath, the Lord’s day, and one of the joys of traveling to be with the church in the world is the gathering with brothers and sisters to celebrate and worship together. Language barriers don’t have to be a problem: hymn tunes are recognizable and if we don’t know the Arabic, we can sing the English snippets we know or create whole new hymns. We can confess in any language. And we stretch out our hands to receive the benediction. We were made to worship and to glorify our Lord, and that is what we set out to do on this Sabbath day. Dear Rev. Nuhad Tomeh had us loaded into the car and on the road from Beirut at 8:30 this morning. 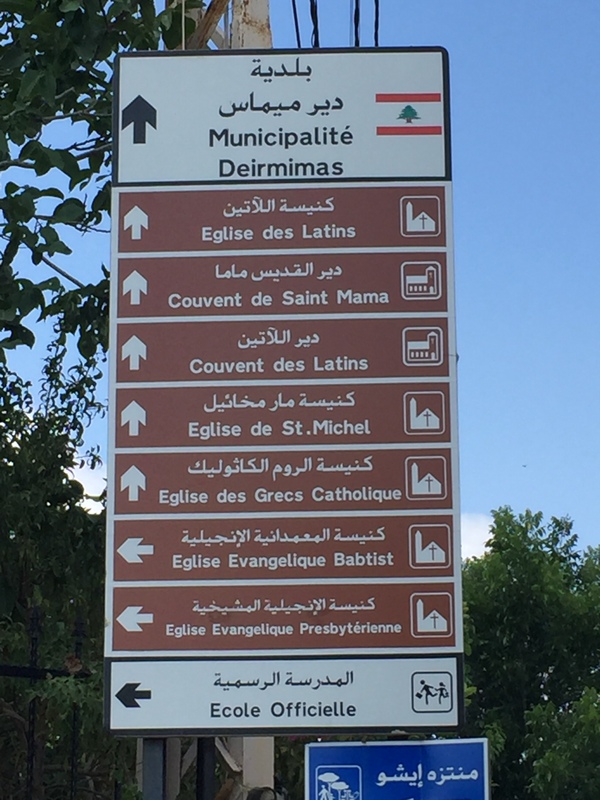 Our destination was the church in Deir Mimas, in the far south of Lebanon, right by the Lebanon-Israel border. We drove through Sidon and by the old crusader castle ruins there and the same fishermen from yesterday with a fresh catch. We turned east before Tyre, where we had spent such wonderful hours yesterday. The view changed from seacoast to rolling hills and eventually the low mountains. We rose on the twisted roads as we came to Deir Mimas, a beautiful mountain town with at least seven churches, one of them the Presbyterian church where we would gather. 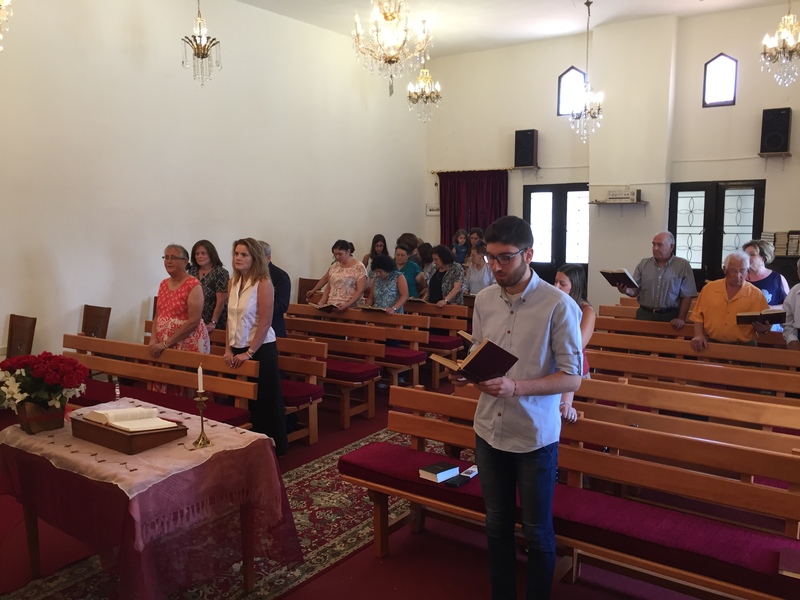 Worship with Deir Memas congregation, July 22, 2018. Deir Mimas church dates to 1861 when the missionaries planted it. It once had around 300 members and an evangelical school, where Dr. Assad Skoury, an elder and leader of the church, told us his father had attended. Many people have left this area due to the long occupation by Israel, and the church now worships about 20-25 people on summer Sundays like this one. Families who have emigrated return in the summer, as the climate is beautiful. In the winter, they only worship two Sundays per month. The numbers don’t matter because as we know, where two or more are gathered in his name, there he is among us. 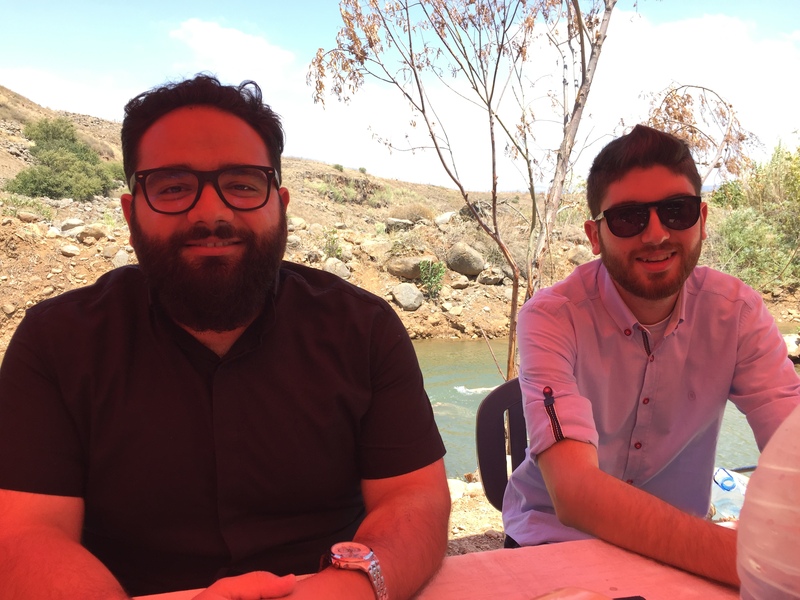 It was a very special treat today, as two Syrian seminary students supported by The Outreach Foundation were on a two-week temporary assignment with this congregation. Adon Naaman of Latakia was preaching and George Shammas of Aleppo was assisting. Dr. Skoury, who runs an amazing clinic and dispensary for those in the area (including Syrian refugees) was our accompanist. As Adon preached his well-presented sermon, Dr. Assad sat next to me and whispered a translation into my ear, most of which I caught. Adon told a very personal story of visiting a gentleman in his Latakia congregation who had been made quadriplegic by a surgical accident. Expecting to be the comforter and encourage to this man, Adon instead found himself the receiver of encouragement when the man reminded him that he should always remember the spirit of life inside him that made him smile. Indeed. As each of us is sent to a wilderness – a wild place, a desert place, a place to be the ambassador of the incarnate one – let us be the smile that begs the question why? and thus share the gospel in the best way. 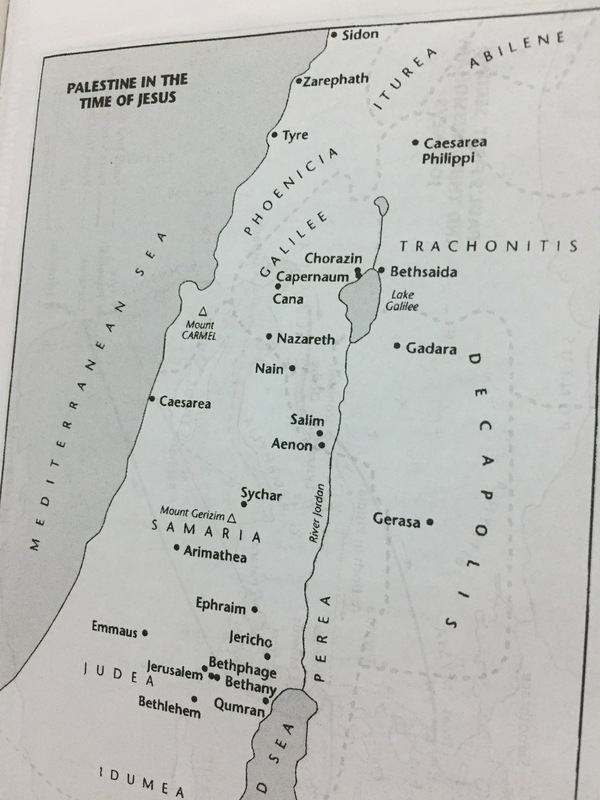 Map from my Bible showing Tyre on the west coast of the land near the top. Deir Mimas would be just a bit south of Caesarea Philippi. After worship we hit the road again, this time for lunch. The twisting mountain road took us right up to the border, not easily missed due to razor wire, electric fences and a wall of tall concrete panels. Looking across from an observation point, it was my first experience confronting the reality of not just a geographic boundary line on a map, but a separation of people. In the map in the back of my Bible you can see where Tyre is in the time of Jesus. Due east and a bit south is Deir Mimas, which is not marked but you know where it is by a modern map. What is interesting on that map in my Bible is that there are no national borders. It is one land. But here, we were confronted by that fence and wall. No entry. 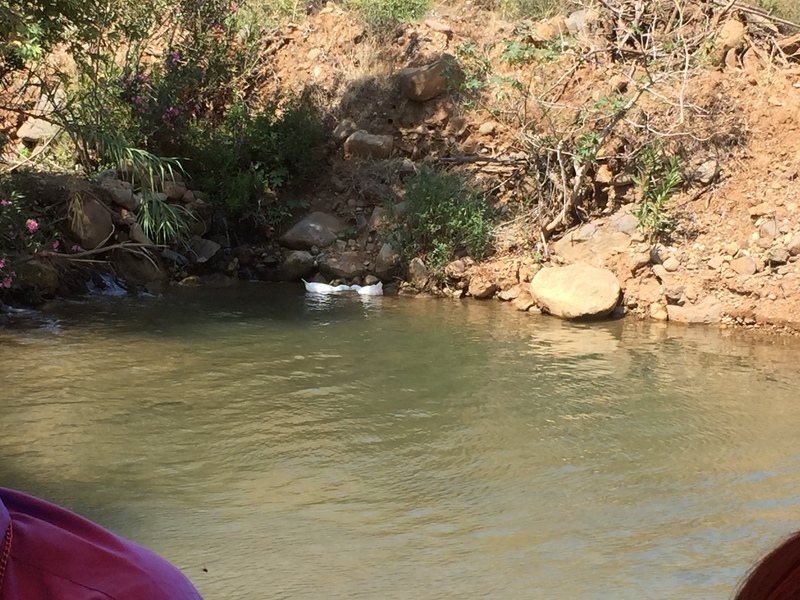 Ducks on the Israeli side of the river. There is no border for them. From there we continued on to lunch outside at a restaurant on the Wezani River. Sitting by the small stream with young people swimming to cool off on the hot day, our hosts explained that the center of the river marked that border again. The river was not deep or wide. It was easy to cross the middle and even get out on the other side, and yet the young people never made the attempt. The invisible boundary kept them on the Lebanese side, even as high up on the hill there were two military checkpoints keeping watch, one Lebanese, the other the U.N. I couldn’t help but notice that the ducks in the water could get in on one side and out on the other, but not the people. There wasn’t a difference in the water; it all ran together. 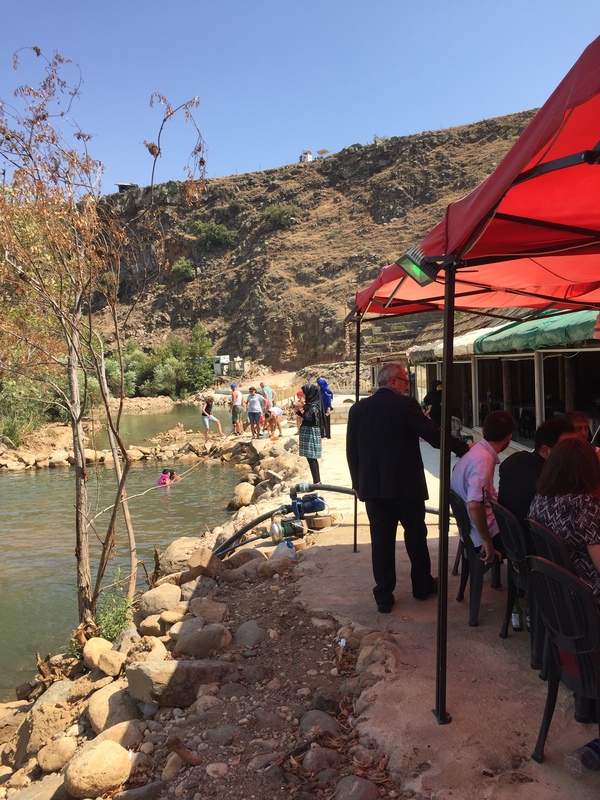 Lunch along the Wezani River, dividing line in this place between Lebanon and Israel. You can see the watch posts at the very top of the hill. I went back to the earlier reading from worship, the one from Ephesians above. “In his flesh” he joins the groups together and erases the boundary. On a night when we have finally arrived at our destination for the women’s conference, driving three hours north to Dhour Chouier on those same twisty roads, my prayer is that one day the boundaries will be truly erased like they are on the map in my bible, and all shall be one in his flesh, and in his name. On this Sabbath, I can pray for no less.